The early history of this unique watermelon is unknown, possibly originally from Russia. Offered in seed catalogs in the 1930's, it was considered then a legendary variety. 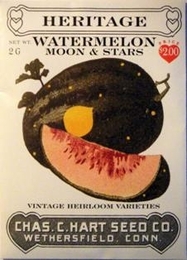 These round melons are dark green, nearly black, covered with small bright yellow "stars" and usually one larger "moon". The flesh is deep pink and very sweet. Plant seed outdoors in late spring after ground has warmed and danger of frost is past, of start indoors 4-6 weeks earlier. Traditionally planted in hills (a small ring of 3-5 seeds). Seeds can also be planted in rows 5-8 feet apart. Cover seeds with 1/2 inch of fine soil, well pressed down. Germinates in 7-10 days, depending on weather. Bulk Heirloom Watermelon seed available. 1300 Seeds/oz. Plant 1oz per 100ft row. 4lbs of Heirloom Watermelon seed needed per acre.